While natural gas fuel stations are opening across the United States, the concern of consistently finding fuel is still a stumbling block for the average consumer wanting to buy a natural gas vehicle (NGV). One solution is home fueling, and a team led by Dr. Chris Hagen, Assistant Professor, Energy Systems Engineering at Oregon State University (OSU) Cascades, thinks it has the answer. OSU secured U.S. Department of Energy (DOE) funding in 2012 to modify a passenger vehicle so its internal combustion could be used to compress natural gas for storage on the vehicle. The goal is to reduce the cost and time for home-refueling, and to improve the convenience and cost for the average consumer owning a natural gas vehicle. With over $900,000 of DOE ARPA-E funding, Dr. Hagen is the principal investigator, with support from Colorado State University and engineering firm CZero, Inc. He’s also co-founded a company to develop the technology commercially. 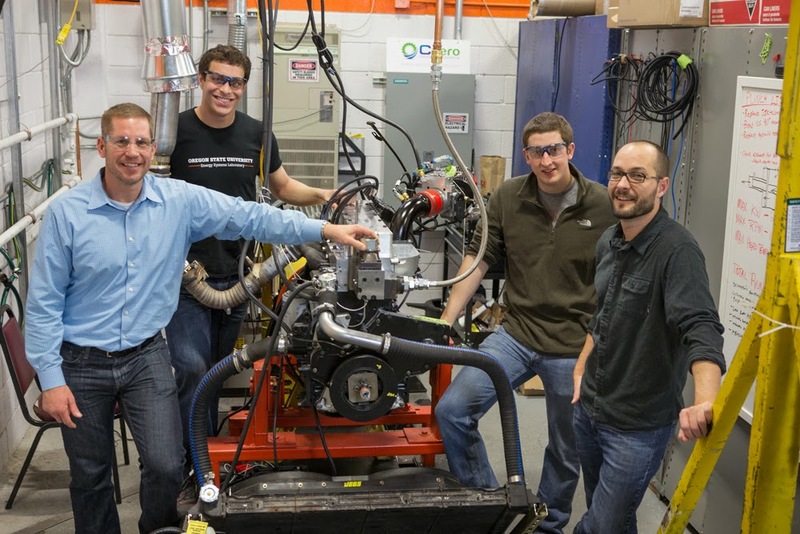 Dr. Hagen said the team wanted to leverage the sophistication of the modern internal combustion engine when brainstorming for a natural gas solution. Using the engine to act as the compressor, they don’t have repeating parts in a compressor on the garage wall, reducing the overall cost of self-fueling. The development engine was modified to allow for two separate “modes” of operation. In commute mode used for driving, the engine runs as normal, firing on all cylinders. In refueling mode, the one or two modified engine cylinders compress gas while the other cylinders operate normally to power the compression and cool the system. The team is now in the lab, testing the bi-modal (both natural gas compressing and combustion) engine. So far, they haven’t experienced any large setbacks. Dr. Hagen says, “Right now we’re testing using atmospheric air. The compression data can be proven out using air and then we’ll switch to natural gas.” The in-cylinder compression proof-of-concept is being tested on a Dodge B-series 6-cylinder 5.9L engine, which can prove the technology for the program, but the team’s ultimate goal is to put the engine in a truck and to drive it 1,000 miles. Dr. Hagen says they have an aggressive goal of a two-hour refueling time, but the team is still refining what’s needed to make that happen. They plan to program the system to shut off when complete. And any future product would also need to be operated in a ventilated environment, preferably outdoors. They hope to develop a system that costs just a few hundred dollars, and the program estimates such a self-fueling unit would pay for itself in under a year. This adds to the existing fuel savings of natural gas over gasoline. While this fuel savings would be a benefit to anyone, Dr. Hagen’s team believes its initial target market is not average consumers but fleets of pickup trucks, where the big three U.S. automakers already offer natural gas vehicles and fleets have been forming the initial customer base. Results from the testing phase of the program are expected late 2014.